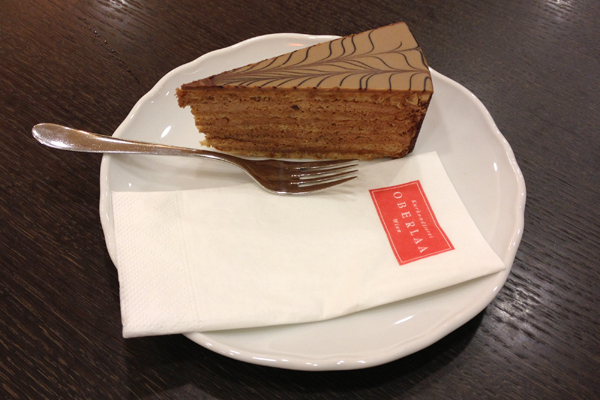 The gluten-free cake scene in Vienna is, quite simply, out-of-control amazing. Would you like chocolate cake served by tuxedoed waiters underneath a series of chandeliers? Try Café Mozart. Do you prefer buttercream-filled layer cake in a Konditorei for royalty? Demel is sure to please. What about an array of gluten-free cakes in a contemporary setting? Kurkonditorei Oberlaa is your spot, and you have a choice of ten locations in and around Vienna! You may be a bit overwhelmed by the dazzling cases filled with cakes, tortes, and delicacies, but not to worry. 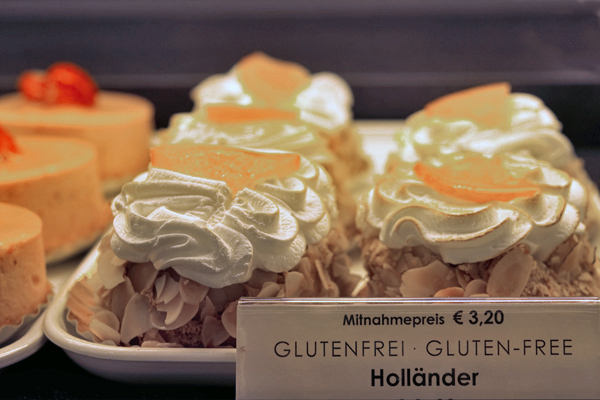 At Kurkonditorei Oberlaa gluten-free choices are numerous and clearly marked. Zero in on the labels that accompany the chocolate-covered, fruit-filled, and cream-topped pastries, and you’re bound to find at least a handful of gluten-free options. You can’t go wrong with the Kurbad Torte. Composed of several alternating layers of spongy nut-based dough and chocolate mousse, this wonderfully rich cake is covered with a nougat glaze. Chocolate lovers, if you have a hard time choosing between this and the classic Schoko-Mousse Torte (solid chocolate mousse in cake form), bring a friend and share the two. 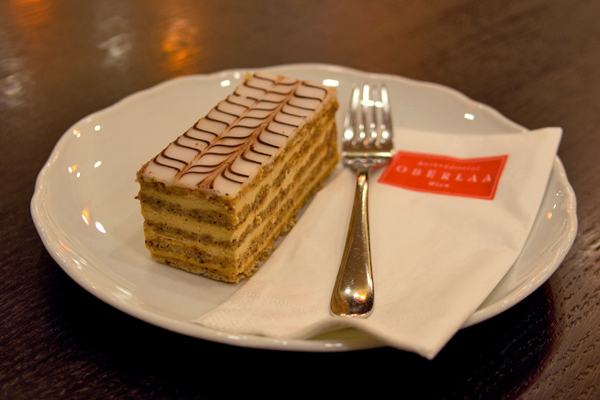 Traditionalists will want to opt for the Esterházy Schnitte, originally created in imperial nineteenth-century Budapest and named for Prince Paul III Anton Esterházy. The layers here are almond-based, separated by vanilla buttercream, and topped with a patterned fondant. Oberlaa’s version is somewhat of a minor miracle, simultaneously densely rich and utterly delicate. A delicious gluten-free window into the pastry world of the Austro-Hungarian empire, it’s not to be missed. For something completely different, try the Holländer. 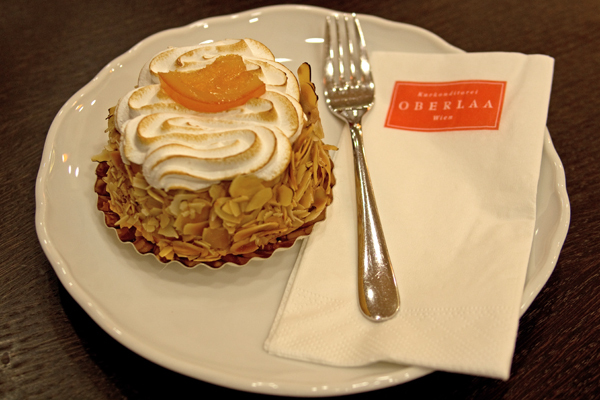 Covered in sliced almonds, topped with meringue, and filled with orange essence and other surprises, this thoroughly unique pastry is a highlight of the thriving gluten-free Viennese Konditorei world. Have you visited Kurkonditorei Oberlaa? Which delicious gluten-free cakes did you sample? Where? Kurkonditorei Oberlaa has several locations in Vienna. I recommend the full-service Mitte location: Landstraßer Hauptstraße 1, Wien (+43-1-71527400). Thank you so much for providing such great information on gf dining in Vienna! I will be visiting in December for the Christmas markets and I am so excited to see all of the great gf options available!!! So happy to help! I hope you have a wonderful trip filled with delicious GF food. You’re welcome to email me if you have any follow up questions! This looks great. Do you know whether they do gluten and milk free options too? They typically have at least one gluten- and lactose-free cake. Several of the sorbet flavors (mango, strawberry, lemon) are both vegan and gluten-free. I don’t think they have vegan or lactose-free milk options for coffee drinks, though. Everything is neatly labeled, so you won’t have any trouble seeing what’s what. Enjoy! I’m in Vienna now on a vacation. I have gone back to this bakery three times.. I have tried everything which is gluten free. I like them all however, I have to say the Hollander is to die for. I’ve had Celiac Disease all my life. Without question these are the best desserts I have ever had. Treat yourself. You cannot go wrong.